A good pair of ski goggles can really help to improve your time out on the slopes. They can protect against UV damage from the sun and help to improve your vision and protect your eyes in a variety of weather conditions. In this article, we are going to provide an in-depth review of five of the most popular designs of ski goggles on the market today. Then, we will look at the features to look for in your goggles and then answer some frequently asked questions. After all that, you should have all the tools and information you need to select the best ski goggles for you! How to Choose Ski Goggles? How to Clean Ski Goggles? How to Wear Ski Goggles? 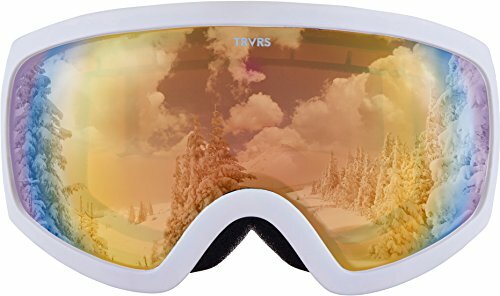 What Color Lens for Ski Goggles? What is VLT in Ski Goggles? We kick off our list with this set of goggles from OutdooorMaster. They clearly have a very attractive design, but what features are they packing under the hood? These goggles boast an OTG (over-the-glasses) style or design, resulting in a slightly deeper faceplate than on other models. It has a dual lens construction with an anti-fog coating on the inner layer. They provide 100% UV400 protection and have an extra-long head strap. 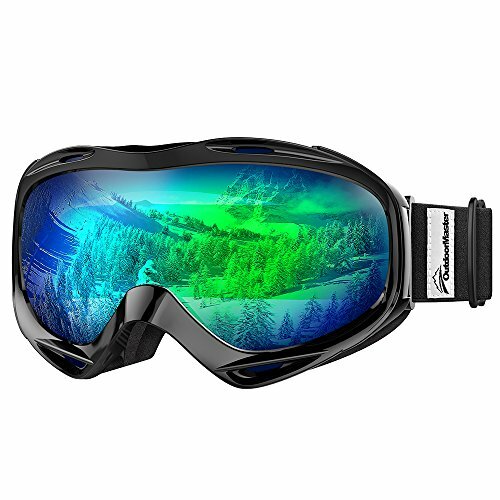 The dual layer lenses are a real stand out with these goggles. The inner lenses have an excellent coating layer on it to help prevent fogging. Along with excellent vents, which should help remove excess body heat and moisture, you have a pair of very effective anti-fog goggles. In practical terms, these goggles are designed to be worn over regular, prescription glasses. That’s always a good feature to see, especially for shortsighted skiers who are not keen on contacts! It also boasts an extra-long elastic strap for compatibility with as many types of helmets as possible. For goggles that proudly proclaim to have a PTG design, i.e., intended to be worn over glasses, they are actually quite small. If you wear smaller, wireframe style glasses, you should be fine, but any larger, plastic frame glasses may be a struggle. We also got the feeling that the inside of the lenses was a little fragile, at least in terms of damage from wiping with anything but a very soft cloth. Now, of course, you shouldn’t be cleaning your lenses with anything but a soft cloth anyway. However, when out on the slopes, it’s easy to accidentally dab at the lenses using a sweater or coat cuff to clean up a bit of snow or moisture. Hence, it would be nice if they had just a little bit of toughness. Next up we say hello to this set of goggles from Zionor. They are the most expensive goggles on our list, so just what exactly are you getting for your money here? Available in no less than 19 colors and lens designs, there is certainly a lot of variety with this product! The lenses have an anti-scratch, and anti-fog coating and the goggles themselves have a good ventilation system. It also has a woven strap that is extra long and laced with elastic. We really liked the overall design of these goggles. The lenses themselves are very well designed, with both anti-fog and anti-scratch protections built into them. Yes, as we said above, you should only clean goggles with a soft cloth, but it’s nice to see that these can take a little bit of punishment. The straps are nice and long and should be compatible with a wide range of helmet types. The frame itself is very low profile, so it won’t interfere with your vision too much. Similarly, the sponge cushioning should do a good job of protecting your face, and there are plenty of built-in vents to remove body heat and prevent any steaming up of the goggles. The problem with this pair of goggles is that the lens is held in place with magnets. This has been done to ensure that you can change out the lenses quickly and easily, which is a useful feature in its own right. However, this makes them easier to be detached than in some models. You need to lift them off your face with both hands for example, and you need to take care when wiping away any moisture. A wide variety of lenses and styles. Beans, chips, soap powder, and skiing goggles, apparently you can get multipacks of just about any products these days and see significant savings too. That’s what we have here, a four-pack of ski goggles. But what are they bringing to the table except for excellent value for money? The big highlight is, of course, the fact that the goggles come in a pack of four. Each pair of goggles is of a different color for variety. The lenses have a single layer, and while they provide some UV protection, they have no anti-fog capabilities. Well, you are certainly getting great value for money here! The goggles themselves have a pretty solid construction. The frame, for example, is made of tough ABS plastic while the lenses are only of a single layer construction but are still built using high-quality PC plastic. Although there are no built-in anti-fog properties, there is a degree of UV protection. All four sets of goggles are of the same size too. All in all, they are of a pretty basic design and construction. For the money though, they will do a job on the slopes provided the conditions are quite mild. Certainly, don’t buy these for a trek to the North Pole! As we alluded above, these goggles are just extremely basic, and nowhere is this more evident than in the lenses. The facts that the lenses have a single layer and have no built-in anti-fog properties are both concerns. The ventilation is okay, so that will offset this to a certain extent, but in general, they simply won’t perform to the levels you could expect from a high-grade product. That being said, so long as you buy them knowing exactly what you are getting for the price, it’s hard to be too critical! This next product is another multipack of goggles. While there may only be two in this pack, they are actually even cheaper (per pair of goggles) than the product we looked at above. What features are they bringing for that low price though? As we mentioned, you are getting a pack of two goggles here. They have a tough ABS frame and single layer PC lenses with UV protection. Again, no anti-fog treatment has been applied. Upon purchase though, you also get a carry bag, which, bearing the low price in mind is actually quite generous. Well, once again, we have a pair of pretty effective goggles here. Yes, there are issues, but the main thing is that they are tough and well designed. Though the lenses lack anti-fog treatment, they do provide a level of UV protection. In use, they will filter light and are suitable for both sunny weather and dimmer light conditions. They will keep the wind and snow out off your eyes, and the vents are very big, providing better airflow. It also cannot be overlooked that these are incredibly good-value goggles. These goggles seem to have a very simple design. 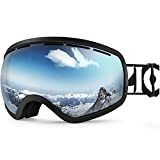 While that has some positives (like the low price) it also means you are missing out on some other features that you may expect on better goggles like an anti-fog coating. Although having huge vents has advantages, they also have some drawbacks such as in very windy conditions wherein they could be a little uncomfortable to wear. Once again though, given the incredible value that they represent, it’s hard to be too critical with a pair of very simple but also very functional ski goggles. A single layer of lenses. We’ll finish up our list with this product from Traverse. It has a number of interesting and useful features as well as a relatively low price point. Is it the best pair of goggles to make our list? Read on to find out! 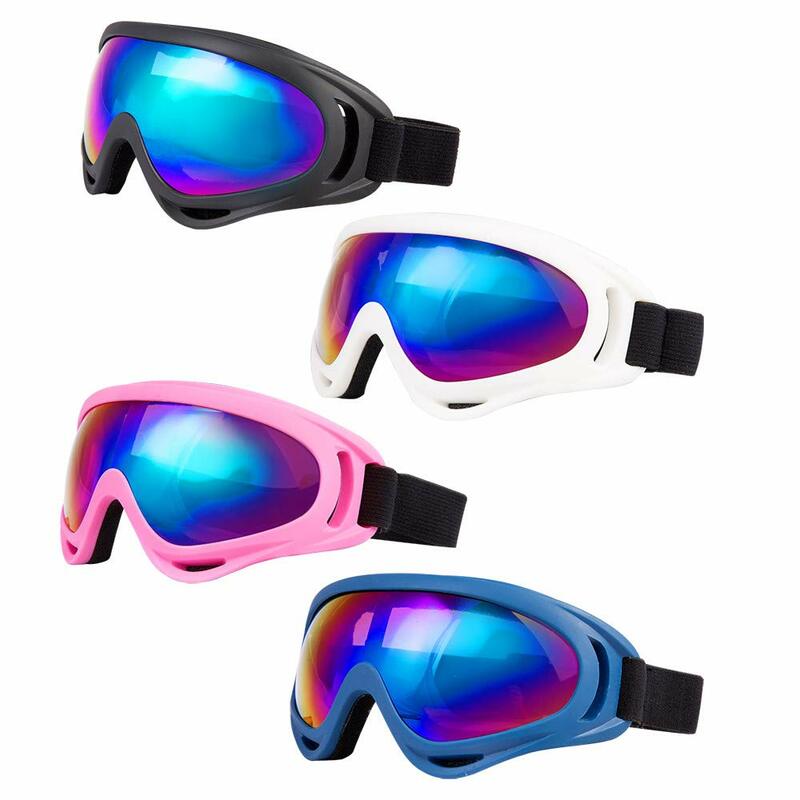 These goggles feature a frame made of flexible thermoplastic polyurethane. They come in four colors, and one clear lens and have a mirror lens option. They provide 100% UV400 protection via the dual layer, spherical lenses. They have anti-fog protection and a good array of vents to keep your face cool and prevent moisture build-up and fogging. We really liked the comfort level of the frame. 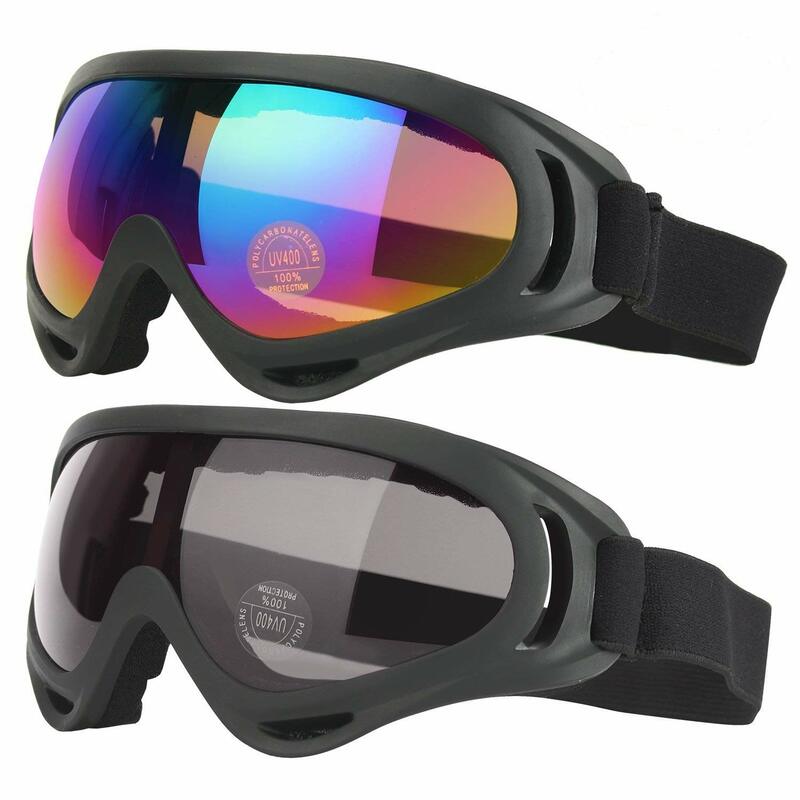 It is very soft and ergonomic, helping the goggles mold to your face for a close fit. The lenses are also very good, and the anti-fog coating does its job. Additionally, the external lens has anti-scratch protection added, but you should still take care of them! UV protection is always good to see, and we were pleased there is a clear version too. It’s always handy to have goggles that are well suited for low-light conditions or very snowy weather. The triple layer of face foam is comfortable and, combined with the flexible frame, does a good job of conforming to your face shape. It is though, as we’ll discuss below, a little on the thicker side. While the frame is comfortable, internally, it is a little on the large side, and the face padding is quite thick. That means it does interfere with your vision a little more than we would like to see with these types of goggles. This is especially true with the nose arch, which is pretty big and can actually impede your vision a little as you glance downward. The five color options are a decent array, but more high-end manufacturers provide more colors and styles to help you choose better. In this next section, we’ll take a deep dive into the features that you should bear in mind while making your selection. If you have wondered just what exactly should the standout goggles be packing to help make them an invaluable tool out on the slopes, then we have the answers for you. When it comes to selecting a lens size, you’re not actually looking at this from the point of view of actually fitting on your face. That will be determined by the frame size, not the lens size. What we actually mean here is that what you need to bear in mind when selecting your goggles is how many lenses you can see. Lens size in this sense is literally how much of the front of the goggles is the lens. This is important because whatever is not the lens is going to be the frame. As being solid, looking through the frame will be hard, so you want as little as you can on the front of the goggles. That said, a stripped back frame equals to a large lens size, and that in turn equals to a better field of vision for you. Frame size will often correlate to helmet size. So, if for example, you wear a small size skiing helmet, consider getting a small frame size. If you have a large helmet, then you should be looking for the larger frame sizes. As far as design goes, if you want a better field of vision, look for a design with large lens sizes with stripped back frames. If you wear prescription glasses, look for OTG (over-the-glasses) frame designs. The material used in ski goggles is pretty uniform across the board. That being said, PC or PolyCarbonate, is the best material for lenses, so keep an eye out for that. It is very tough, impact resistant, lightweight, and provides 100% protection from UV rays. If the lenses have anti-fog treatment, then all the better! Aside from that, it is a good idea to look for those with high-quality sponge materials in the face padding and a decent amount of elastic in the strap so that it can stretch over your helmet. If you plan on using your goggles during competitive skiing, then there are a few features to bear in mind. The lens size should be large or oversized to allow you to keep as much of your field of vision clear. It is also advisable that you look for extra ventilation, as you are going to be creating more body heat that needs to be vented away. For the same reason, anti-fog treatment could be very useful too. Broadly speaking, it is a good idea to pick up goggles that are explicitly designed for your gender. It’s not the end of the world if you don’t, but in general, gender-specific goggles will simply be sized and shaped a little differently for the differences in mass and shape between the typical man and woman’s face. There is a whole range of other features to keep an eye out for, such as if the goggles have a lens changing system. In other words, can you pop out the lenses and replace them with different ones? That can allow you to tailor the lenses you use to different weather conditions. We’ve also mentioned anti-fog protection through this product guide but it is well worth mentioning again as this is a stand-out feature that is well worth investing in. The same goes for UV and anti-scratch protection properties. Remember that the strap is also an important feature because well, it is the thing that keeps the goggles on your head! Look for extra-long straps and ones with elastic in them. That way, you know that you have a better chance of finding goggles that are compatible with your helmet. Ski goggles are fashion pieces but are also protective equipment. To that end, you should definitely consider their looks when you are selecting the model that you like. 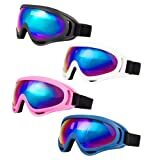 You are after all going to need to wear them on the slopes, which is a public place, so you really do need a set of goggles that you will be happy to wear and be seen wearing. The other issue is with protection, specifically from light conditions. Ideally, the goggles you select should provide UV protection of some description. They should also protect against light glare that may come from the snow. The answer to this question is to clean them very carefully! Even if you have a set of goggles with an anti-scratch coating, that is certainly not a license to treat them roughly. You should also always try to clean your goggles after every use. Use a soft cloth or the bag that the goggles came in which often doubles as a cleaning cloth. It’s also a good idea to let the goggles air dry after every use, and never dry them out in the sunshine, on a radiator, or with a hairdryer! Also, try not to put the lens downwards onto a table, rather, put them on their back so that they rest on the sponge padding. Is it flippant to say you wear them on your face? Jokes aside, many people worry about the conditions that are right for ski goggles. The answer is that they can be worn anytime you ski or snowboard. 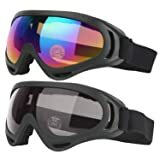 Simply ensure that you are wearing goggles that allow a certain level of light to penetrate the lens that is appropriate for the conditions you are skiing in. For example, it may not be a good idea to wear your highly mirrored goggles on a very overcast day. Selecting the right color for your lenses is not just a question of fashion! Each color will perform better in certain conditions. Yellow, for example, lets in a lot of light when conditions are flat or dull, so they are a great option on cloudy days. At the other end of the scale, you want darker colors for sunnier days. Brown, for example, or even black will block a lot of light energy. Remember too that a mirror surface will also do its share of light blocking by reflecting light rays away from your eyes. VLT stands for Visible Light Transmission. This question is actually connected to the one above, as the VLT is a reflection of the amount of light that can penetrate the goggles’ lens. The lower the number, the less light can pass through, so goggles with low VLT are better suited for very sunny days. 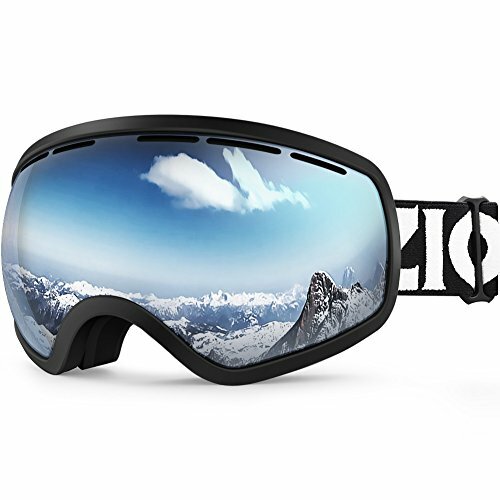 After careful evaluation, the Zionor Ski Goggles is the best ski goggles on the list. Yes, a couple of other models came close, but at the end of the day, this pair of goggles had everything we were looking for in a great pair of skiing goggles. These goggles look great, and they offer a high level of protection from UV light and other elements. The frame has also been stripped back to minimize impeding on your field of vision, and they have a very effective strap.